I made a paddle shape and two triangle shaped blocks of wood. Then drilled a hole to fit the router. 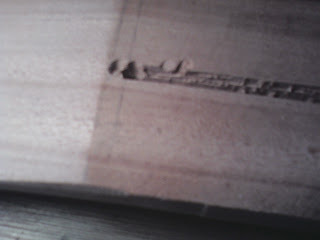 I then cut a slot, so I could tighten the router on the paddle. 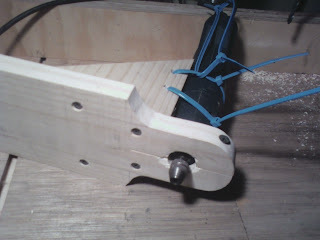 Here are some more photos of the jig. 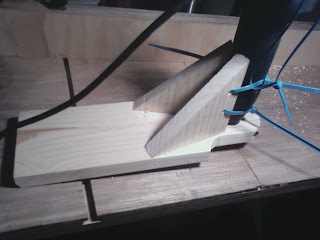 I placed a long drill bit in the dremel and used a chisel to the triangle blocks of wood and squared the drill bit to the table. I secured the jig to the underside of my drill press table. 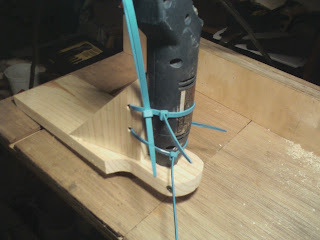 I did this on Monday and decide to go get the correct sized router bit on Tuesday. Tuesday came and I purchase a bit and did some practicing in some pine. Using the table's fence the jig worked perfect, except I purchased too big of a bit. I asked the hardware store salesman for a 3/16" bit and I was given a quarter. (I never checked the size on the package). It's OK because I can use this bit for the binding later. 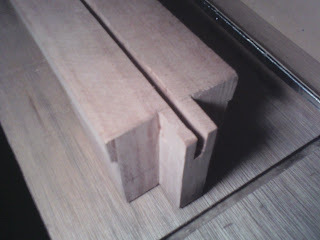 Now cutting pine and cutting mahogany are two different animals. Attempting to make this channel in two passes: 1/4 then 1/2 just wouldn't work. Smoke was pouring from the blade, so I decided to try 4 passes. This worked good until I got to the final pass. The bit started to move! UHHHG! 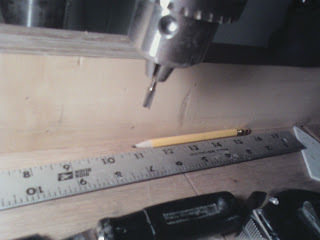 I tried everything I could think of but that darn blade kept moving (out of the chuck creating deeper bite) – and I was afraid I was ruining the dremel tool by tightening the chuck so hard. I was so frustrated I decided to just stop before I ruin the neck too. The next day I thought of how I could make that final pass. 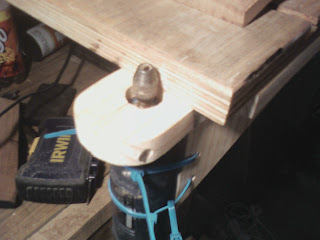 The drill press – I knew I could lock that bit in and it wouldn't move. That worked and I had the channel routed. I did make two mistakes – went too far on the first pass and nicked the side of the channel. Fixed the mess up with wood glue and saw-dust. 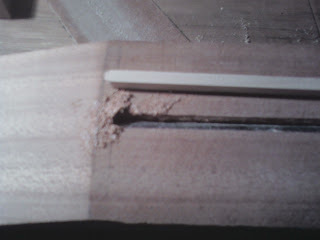 Then started making the truss rod cap out of maple. This will be hidden so I could have used any hardwood. 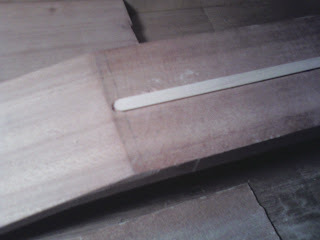 Oh I forgot, I wrapped the truss rod with metal tape before placing it in the channel. Getting close to the correct size. Tons of sanding to make this fit perfect. 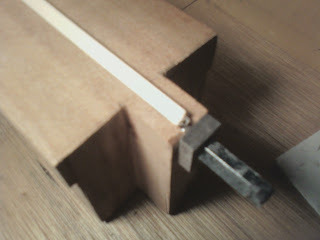 Below is the cap inserted and glued down (with white glue – for removal later if needed.) Not shown, I planed the maple down and then scrapped it level with the fingerboard. Turned out much better than I thought it would!